Bitcoin kicked off 2017 with a bang. The value of the digital currency topped $1,000 on Monday, its best level in at least three years. 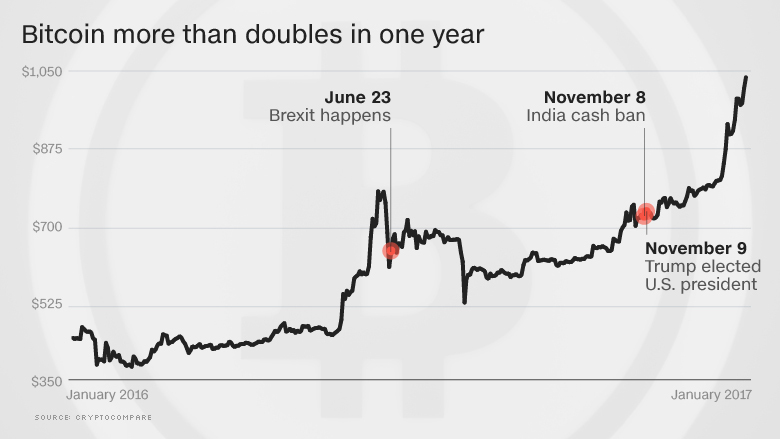 Bitcoin has spiked in recent months following a series of unexpected global events kicked off by Brexit, the election of Donald Trump and the sudden ban of large rupee notes in India. "It was a perfect storm of events," said Charles Hayter, founder and CEO of digital currency comparison website CryptoCompare. "Uncertainty is key." Hayter said the rise of populism globally means that "walls are going up rather than coming down," and people are seeing higher risks of trade wars and other fallout from the ratcheting up of tensions. All this has led Bitcoin's value to more than double in the past year to $1,023, from around $430. Just since Trump's election, it has spiked 40%. Bitcoin is preferred by some people for its perceived anonymity, and it has also been used for illegal purchases of drugs, and other products. The value of Bitcoin has fluctuated wildly over the years. In 2013, Bitcoin increased tenfold in just two months to $1,151. However, a hack on the Tokyo-based Mt.Gox Bitcoin exchange in 2014 sent the currency plunging to less than $400. 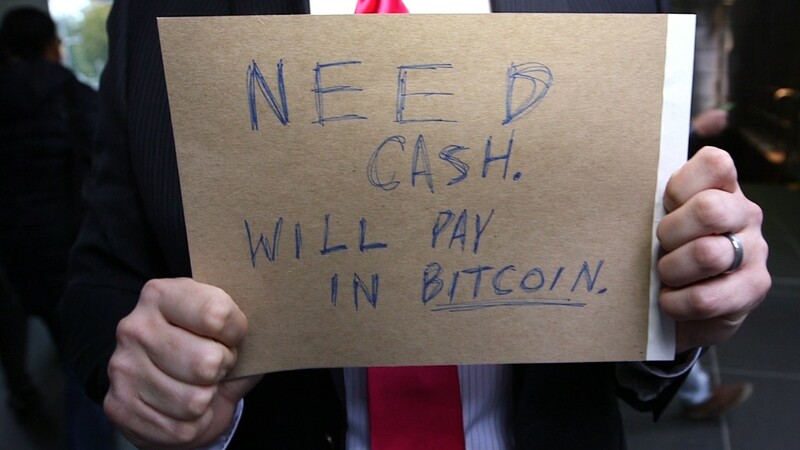 Bitcoin was created anonymously online in 2009. It belongs to no country. It's not recognized by any government as "legal tender." Yet, it is the best-known and the most popular digital currency. Hacking continues to be a major issue. As recently as August, hackers stole Bitcoin worth about $65 million after attacking a major digital currency exchange Bitfinex. But despite the controversy over the years, Bitcoin-related startups have attracted big name investors. Among them: American Express (AXP), Bain Capital, Deloitte, Goldman Sachs (GS), MasterCard (MA), the New York Life Insurance Company, and the New York Stock Exchange. They are betting that the technology will change the way we trade stocks, send money to each other, get paid at work, and much more. --Jose Pagliery contributed to this report.